Nodes can be cloned within the same workspace or to another workspace; cloned nodes must be cloned from one workspace into another. Nodes can be cloned to a specific name under a specific parent, but can only be added as a new child node at the end of the new parent's children; nodes can be cloned to an exact location among the parent's children, replacing the existing node at that location. 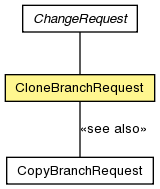 Create a request to clone a branch to another. Get the name of the clone if it is to be different than that of the original. Get the name of the workspace containing the branch to be cloned. Get the actual location of the node after being cloned. Get the actual location of the node before being cloned. Get the set of nodes that were removed because of this clone operation. Determine whether this clone operation is within the same workspace. Gets whether the clone should remove existing nodes in the new workspace with the same UUID as any of the nodes in the source branch or should throw an exception if such conflict is detected. Set the locations of the nodes that were removed by this operation, if removeExisting() is true. the desired name of the clone, or null if an exact segment is specified.